Nuketown, you either love it or you hate it, like some sort of shooty yeast extract. It’s one of the most intimate of all of Call of Duty’s arenas, which means death often comes in the form of an explosive tossed from the far side of the map. But when you’re in the zone and not on the receiving end of sudden explosion-based death, it feels incredible. Like shooting? Here are the 15 best first-person shooters on PC. It’s basically two houses, their back gardens, and a little bit of street in-between, two vehicles obscuring the view at ground level. You can loop around the map like a NASCAR track, gunning your way around at speed and chaining kills together uninterrupted. 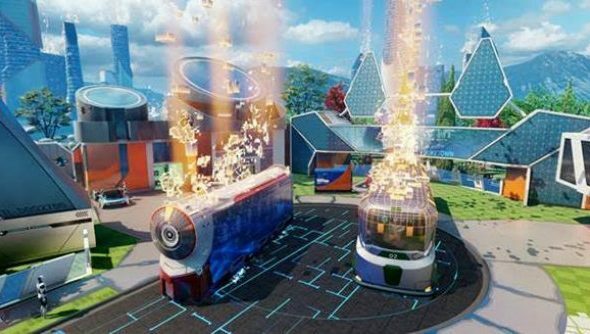 The map’s redesign for Black Ops 3 looks to make these moments even more frequent. As well as making the town look more futuristic, with it taking placing in some kind of VR simulation, there are billboards and barriers that act as platforms to wall-run and dash across, jumping between them as you spray bullets at enemies below.